Actor Corey Feldman is threatening to leak emails unless Hollywood studios agree to make more movies starring Corey Feldman. Feldman said he got the idea after watching news coverage of the recent hack of Sony that may or may not have been committed under North Korea’s direction. 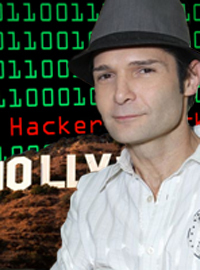 Feldman has given Hollywood studios one week to begin production on movies starring Corey Feldman. If the studios do not comply in that time, Feldman says he will begin releasing the emails. Los Angeles police are looking in to the case to determine what crimes, if any, Feldman has committed. It’s unclear what the emails contain but Hollywood experts believe the emails could contain remarks about projects, stars or what some studio execs ordered for lunch. Feldman says he came across the emails while digging through the trash outside Fox Studios. Federal agencies are urging the studios not to give in to Feldman’s demands.